Hunting boots may raise a few question marks in the first place – do you actually need special boots to go hunting? The truth is you do. You need a good traction on all kinds of terrains, as well as comfort and performance. Built specifically for harsh outdoor uses, the Irish Setter Men's 2870 Vaprtrek Waterproof Hunting Boot represents one of the top choices for hunting sessions. 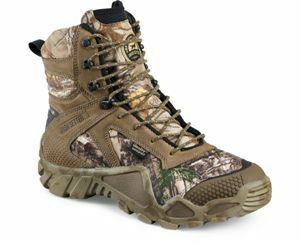 There are plenty of waterproof hunting boots reviews that claim on their efficiency on hunting trips, making this model one of the best rated choices for hunters. However, just like for any other kind of footwear, a little research is still needed. Designed to be durable and able to face the harshest weather conditions, these boots from Irish Setter won't disappoint you. They only come in one type of design though – camouflage, yet this won't affect their performance. Compared to other models in this segment, they're way cheaper, but without compromising on quality. From this point of view, they provide great value for money. All in all, when looking for the best waterproof hunting boots, it still pays off researching their features and understanding how they can raise to your expectations. So, what makes this model so popular? Scent control is a necessity for everyone, yet many manufacturers overlook it. For this reason, footwear ends up smelling within weeks only. It's not going to happen with these boots though. According to a series of reviews, the ScentBan technology works like expected. No one wants to come home and kill all the flowers in the house when they take their shoes off. Furthermore, animals do have an amazing sense of smell. In other words, when animals catch whiff of your smell, chances are they'll avoid the area and leave you wasting your time. Which is why Irish Setter has invested in this special technology. The fabric is breathable, so the nasty odors stay out of your boots. The good news is that the breathable profile doesn't affect the waterproof capabilities of these boots. You usually can't have both breathability and waterproof capabilities, yet every best hunting boot review claims it's possible with these boots. You no longer have to compromise. 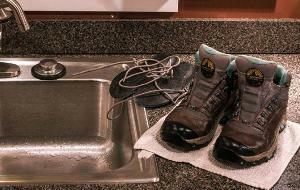 You can forget about smelly warm feet or odor-free wet feet. A serious hunter knows how important it is to keep feet dry and warm. 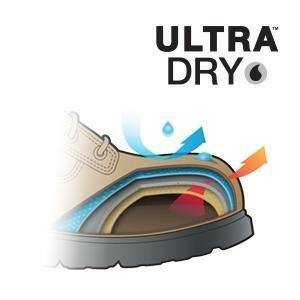 This model is equipped with the UltraDry technology. In simple words, the boots are waterproof. They feature waterproof lining around all the membranes in their composition. The waterproof feature won't work against random moisture, wet grass or light rains only. Instead, you can just as well cross through a creek or hunt in pouring rain without having to worry about your feet. The more you research waterproof hunting boots, the more discrepancies you'll find between one model and another. Many boots are made from cheap materials like plastic, as well as thin or low quality leather. In other words, they'll survive only if you go hunting once a month. Everything changes with this model though. These boots are made from solid composite materials. They're comfortable and durable, but they also reduce the overall weight by up to 50%. After all, this pair barely weighs 2 pounds – that's about two times less than most other boots in this range. The RPM technology targets the sole. It wraps around the boot for extra protection against small things you'll run into in the wilderness, such as branches, roots or muddy areas. They even feature snake protection – a must for hunting shoes that many manufacturers overlook. What are the first parts of a boot to wear off? Exactly – the toe. The second most fragile part is the heel. That's where all the pressure goes. Whether you go up or down the hill, the pressure will be on the toe or the hill. For this reason, the 2870 Vaprtrek model comes with the Armatec technology. It's practically a reinforcement feature around the most exposed areas. Surprisingly enough, you won't feel like walking in iron shoes. 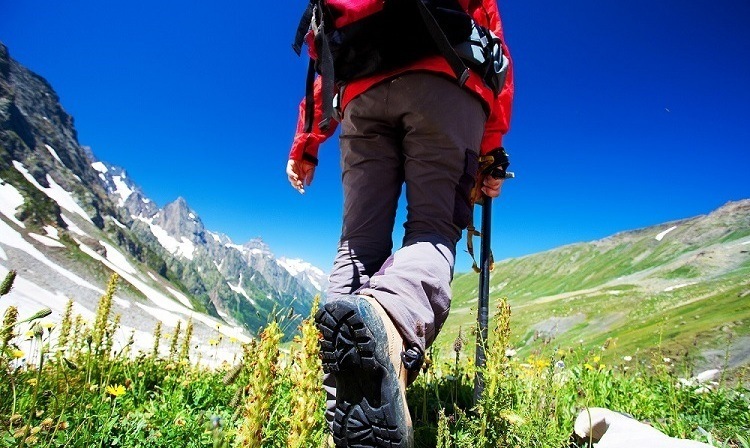 In fact, the technology is soft and allows you to feel the terrain and adjust your walking. According to some reviews, these boots feel like wearing sneakers with plenty of extra protection and sturdiness. Sizing could be an issue for those with wide feet, but it does have a solution. These boots don't come in more widths, yet a larger size will inevitably add to the width too. However, if you have wide feet and thick ankles, you might have an issue. Why? – The boots is covered in plenty of protective materials and armor. However, there's an easy solution – we recommend you to order half a size larger. In fact, professional hunters actually recommend buying half a size bigger because you'll probably have to wear thick and heavy socks too. Even without such socks, you'll need plenty of toe room for a comfortable hunting experience. Luckily, the boots come in literally any size you can think of. In terms of design, the RealTree camouflage style is the only one available. It's not all about good looks, but also about performance. 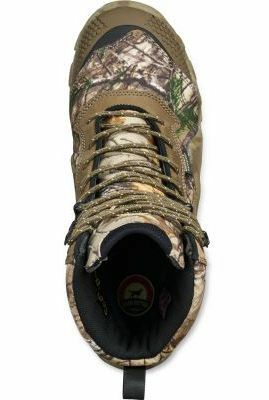 The design features lots of camouflage patterns, making your boots almost impossible in the woods. Hunting boots tend to be tight and put lots of pressure on the shin. You try to keep them tight and fit, but you end up with a painful shin within one hour, so you need to loosen them a bit. That's when you basically compromise on traction, efficiency and stability. These waterproof hunting boots for men are built to fix this issue. Forget about the shin pressure, as these boost were engineered with the CuShin Comfort technology in mind. It's patented, so you won't find it in other boots. The mesh is thickly padded and features a four way stretch nylon. The tongue will feel like embracing your shin, rather than putting tension and pressure all over it. Not only will you feel more comfortable, but you'll also gain some extra efficiency and stability. When it comes to care and maintenance, there's not much to do about these boots. Never put them inside a washing machine. Just clean the dirt off with a damp cloth. You don't even need to use soap, but if you do, stick to a non-scented one. Let them dry naturally. 1. Which boot size is correct? These boots feature the same sizes as regular street footwear. Hunting boots should normally be purchased half a size bigger for extra toe room, but also to accommodate thick or heavy socks. The bigger size should also accommodate extra wide feet. 2. What socks should I wear? Regular socks are suitable for most Irish Setter boots. However, being non-insulated, these boots might require heavy or thick socks during the wintertime. That's why professional hunters often purchase half a size bigger. 3. What's the difference between men's and women's boots? It's highly recommended to get the right style, even if you fancy a particular model for the other gender more. Women's boots normally come with a narrow heel, as well as a more rounded toe box. The arch is a bit higher too. As for men's boots, everything else is different. Bottom line, it's easy to tell why you can find so many Waterproof hunting boots reviews. This Irish Setter boots come with great value for money and can easily compete against boots that cost two or three times more. They're sturdy, durable, comfortable and stable – all the main requirements for a good hunting experience. It's no surprise why they're so well rated – 4.6 out of 5 stars.